Having healthy, beautiful and glowing skin is important to virtually everyone. If you are in the market for glowing-skin body lotion, you probably know there are hundreds of products on the market today. To help you find the best body lotion, we have developed a list of the 10 we think are a worthwhile investment. 1. Who Uses Glowing-Skin Body Lotion? Anyone who wants to improve the look and feel of his or her skin often uses a glow-skin body lotion. 2. Where Can You Buy Body Lotion for Glowing Skin? If you want to purchase body lotion for glowing skin, you have several options. Most big-box stores and beauty retailers sell these products. They are also available for purchase online, either directly from the manufacturer or through a third-party seller, such as Amazon. 3. How Much Does Glowing-Skin Body Lotion Cost? Glowing-skin body lotions vary considerably in price. Some bottles sell for a few dollars, while others cost more than $100. Our goal is to provide you with an honest, reliable assessment of the best body lotions for glowing skin. In compiling our rankings, we considered the following factors. Body lotions for glowing skin sell at a variety of price points. While you can spend well over $100 on body lotion, you can likely find a good bottle for under $10. The products on our rankings range in price from $4.75 to $49. CeraVe Moisturizing Cream acts as both by effectively hydrating as it helps restore the skin’s protective barrier. 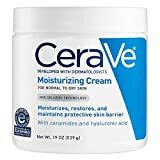 Developed with dermatologists and ideal for dry and very dry skin on the face and body, this rich, non-greasy, fast-absorbing moisturizing cream features patented MVE Delivery Technology to release a steady stream of hyaluronic acid and three essential ceramides throughout the day and night. Suitable for sensitive skin, this oil-free and fragrance-free ceramide cream also helps the skin hold on to moisture while improving its look and feel. Mario Badescu Summer Shine Body Lotion, 6 oz. Mario Badescu Summer Shine body lotion should be in everyone’s bathroom during hot summer months. In the heat, skin can dry out and lose its healthy appearance. Daily applications of Summer Shine from Mario Badescu help alleviate the discomfort and dryness that is often commonplace when temperatures rise. This product uses vitamin A to provide your body with essential moisture. Subtle shimmering compounds in the lotion give you an overall look of vitality and youth. As you likely know, many body lotions leave users feeling greasy. Mario Badescu Summer Shine is specially formulated to go on smoothly without depositing a greasy residue on the skin. The lightweight formula is simple to apply and makes you feel great. 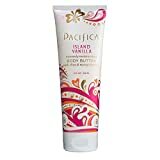 Pacifica by Pacifica Crystal Glow Power Shimmer body lotion is probably not a universal product. Instead, this lotion is likely best suited to those with feminine sensibilities. The gentle fragrance of this lotion reminds us of springtime and vanilla. Even though we like the gentle aroma of the lotion, we love the moisturizing radiance this product offers. While many companies test their lotions on animals, Pacifica never sends its Crystal Glow Power Shimmer to the animal lab. In fact, this product is animal-friendly, cruelty-free and vegan-safe. Instead of petroleum, parabens and other traditional ingredients, Crystal Glow Power Shimmer uses rose quartz, watermelon oil and lemongrass essential oils to keep your skin feeling moisturized, healthy and alive. Body gel oil that revives dry and dull-looking skin for a healthy glow. Everyone wants a healthy glow in the summer. Sitting out in the sun or hitting up the tanning bed, however, can have serious health consequences. 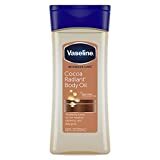 Within the Vaseline Intensive Care line, we find Cocoa Radiant body gel oil. This lotion uses cocoa and shea butter to moisturize skin while leaving behind a subtle radiating glow. The primary ingredient in Vaseline Intensive Care body gel oil is glycerin. This substance is found in many body lotions, as it uses the skin’s natural healing process to provide restorative relief. As such, Cocoa Radiant is suitable for damaged skin, dry skin, cracked skin or dull skin. Because microdroplets of Vaseline mix with other ingredients, you can be certain your skin feels conditioned even hours after you apply Vaseline Intensive Care Cocoa Radiant lotion. If you have ever used beauty products from Clinique, we probably don’t have to convince you of their quality and effectiveness. The company’s Dramatically Different Moisturizing Lotion+ is, well, dramatically different than other lotions for glowing skin. Unfortunately, the product works best as part of a complete Clinique beauty regimen. Since we evaluated products for their standalone benefits, we rank Clinique Dramatically Different Moisturizing Lotion+ at the halfway mark on our survey. Your skin has a natural moisture barrier. Regardless of environmental conditions, this barrier helps retain moisture. Of course, the barrier is not perfect. When the environment gets too rough, your skin dries out. Dramatically Different uses a scientific formula to strengthen the moisture barrier by 54 percent. We like this product for its fragrance-free design. Not all affordable body lotions do a good job of turning dull skin into radiant skin. Olay Quench Simmer does. For only $5.50, you get 11.8 ounces of moisturizing goodness. After just one application of this body lotion, you receive 24 hours of bright, soft and revitalized skin. The slight shimmer in the lotion reflects light, making your skin appear healthy and vibrant. Moreover, the vitamin E, vitamin B3 and essential minerals in the lotion’s recipe help delay the effects of aging. With continued use, skin is more elastic and suppler. Unfortunately, Olay Quench has some chemicals and fragrances that may not be acceptable to everyone. We would like to see a cleaner formula. Still, the skin benefits of Olay Quench are impossible to ignore. For best results, apply the lotion after a shower when skin is slightly damp. There are some great body lotions for glowing skin. In fact, the seventh entry on our list, L’Oreal Sublime Glow Daily Moisturizer + Natural Skin Tone Enhancer, could easily rank in the top three. While we love the moisturizing effects of this product, we understand that not everyone is looking for a sun-free tanner. Still, if you want to gradually darken your complexion without exposing your skin to harmful UV rays, this product is an excellent option. While L’Oreal Sublime Glow has glycerin and other conventional ingredients, it also has vitamin E, mango butter and sweet almond oil that moisturize and condition dry skin. The special formula ensures even application without leaving a greasy residue on the surface of your skin. Even though AHAVA mineral body lotion is in the bottom third of our rankings, we are obsessed with the product. We ranked it lower than other body lotions because of its fragrance. For some users, the smell is unpleasant and strong. 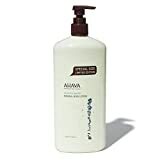 Nonetheless, AHAVA lotion is approved for sensitive skin, which is appealing to us. The minerals for this product come from the Dead Sea. The cleansing properties of the lotion are impossible to ignore. We do know, though, that the minerals in the proprietary recipe include mineralized water and Dead Sea compounds. These help reduce inflammation and restore a healthy moisture balance to the skin. The lotion also has toning witch hazel, which tightens skin and reduces dark spots. Like L’Oreal Sublime Glow, Malibu Tan Hemp Skin-Firming Bronzing Moisturizer darkens your complexion while moisturizing your skin. This product, however, uses hemp to lock in essential moisture while adding a beautiful, healthy glow. If you are worried about getting a contact high from using a hemp-based product, you can relax. The ingredients in Malibu Tan are THC-free. This product also has CoQ10 to give your skin a soft, resilient and supple tone. We like that it isn’t tested on animals. As you have likely noticed, we haven’t had many bad things to say about the body lotions for glowing skin that we reviewed. Simply put, there are some excellent products on the market today. 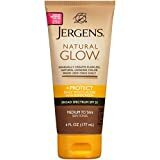 Jergens Natural Glow + Protect Daily Moisturizer Sunscreen is another one. This lotion moisturizes and brightens skin while blocking dangerous UV rays. The result is suppler skin with increased peace of mind. The SPF rating on this product is 20, so be sure you reapply throughout the day for ultimate protection. At almost $50, EC Garden Flawless Glow Brightening Cream isn’t cheap. The glowing results, however, are worth the effort. While the EC Garden cream is mostly intended for face and neck moisturization, some users apply it all over. For best results and to save some cash, you may want to combine EC Garden Flawless Glow with another lotion. Each of the other nine on our list is an excellent choice. In fact, we don’t think you can go wrong with any of the products on our list of the 10 best body lotions for glowing skin.